Easy slow cooker chicken parm soup! 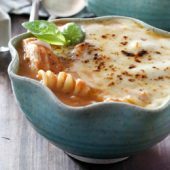 A classic meal reinvented into a flavorful soup, packed full of chicken, pasta and cheese! To the bowl of a 5-6 quart slow cooker add chicken, vegetables, tomato sauce, spices, chicken broth and bay leaves. Cook on high for 4 hours or on low for 8 hours. Remove chicken, shredding with forks. Set aside. Remove and discard bay leaves. Use an immersion blender to puree the soup. Alternatively, soup may be pureed in a blender in batches. Stir in parmesan cheese and heavy cream until fully combined. Return shredded chicken to the soup along with uncooked pasta. Cover and cook for an additional 30 minutes. Serve with shredded mozzarella and optional parmesan cheese. Use a kitchen torch to melt and lightly brown the cheese. Alternatively, soup may be browned under a broiler in oven safe bowls. *For best results, use uncooked boneless skinless chicken breast, fully thawed.